Originally published on Rising Voices. The 2012 Rising Voices microgrant competition attracted plenty of interest from the East African countries of Uganda and Kenya. Rising Voices has had previous experience with grantees from this part of the world, as the magnet theater group Repacted from Nakuru, Kenya was part of the first class of grantees in 2007. They trained members of their organization how to use citizen media to showcase their work, which uses the arts for prevention efforts and to raise awareness about health issues such as HIV/AIDS and TB affecting their local community. 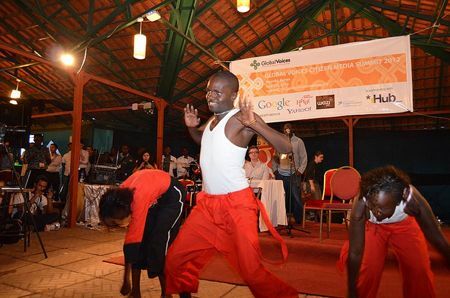 We were able to reconnect with our alumnus project, when Repacted members recently performed at the Global Voices Summit held in Nairobi in July 2012. Since the Summit was held for the first time on the African continent, we hoped to find a way to better engage some of the hundreds of applicants that we were unable to fund, but whom hold a lot of potential to implement their citizen media outreach project. For the first time in our history of GV Summits, we were able to offer travel scholarships including a free registration to previous applicants to the microgrant competition. This opportunity was open to all Kenyan and Ugandan applicants from the past two years, who submitted a short essay explaining why they wish to attend the Summit and how they would benefit from the opportunity. Again, the response was overwhelming, but we were able to offer five travel scholarships to individuals that have been able to implement part of their original project proposal. Grace Atuhaire (Kampala, Uganda) has been working with Earlylife Radio to create an online platform to encourage citizen journalism. Through a partnership with the Bavukuka Foundation, they created an online media hub called “Read my Lips,” which hosts online dialogues and debates about local and regional issues. Wakibu Bunnya (Kampala, Uganda) has been working with the Women Vibes Program, which includes a citizen media training component for 12 young women in the Bwaise slums of Kampala. These women recently took part in a citizen journalism training program, where they learned how to report and tell their own stories using digital media. Freddy Kamakei Sangiriaki (Narok, Kenya) has been working with the local project Neighbour's Peace Initiative that aims to use an SMS platform and social media to engage in peace-building campaigns. Milton Aineruhanga (Kampala, Uganda) works with the Women of Uganda Network (Wougnet), which opened its training center in April 2012. This center provides internet access to its members and will be the central meeting place for a series of digital media training workshops. To see a photo album of the training center, please visit this Facebook album. Thomas Bwire (Nairobi, Kenya) works with a local organization known as Uweza Aid Foundation. He also has been collaborating with the Uweza youth journalism club in Kibera, which provides skills-building workshops in research, writing, photography, and blogging. The plan is for the youth to create their own blog (coming soon), which will provide them with a platform to express themselves. Wakibu Bunnya at the GV Summit. Photo by Bunnya. I have had a chat with the entire Uganda delegation to the summit and they are interested in starting up a National movement of bloggers and citizen media activists. we want to start by undertaking research about existing blogger movements in the country. We will keep you posted. 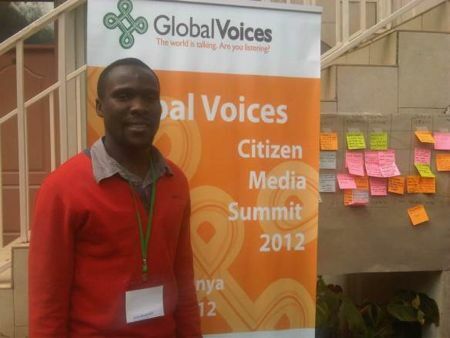 We'll continue to monitor these citizen media initiatives in Kenya and Uganda, and we hope that their experience at the GV Summit can be an inspiration for helping their local communities use citizen media to join the global conversation.